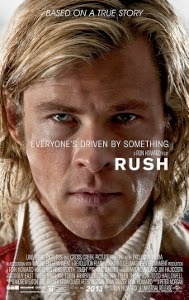 Don’t be fooled by the posters and trailers for Rush, Ron Howard’s Formula One racing biopic, that prominently feature Chris Hemsworth. 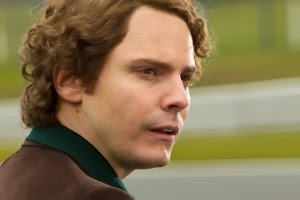 The real leading man is the far lesser-known (in the U.S. at least) German actor Daniel Brühl. 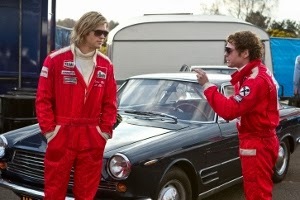 The film tells the true story of former F1 World Champions Niki Lauda (Brühl) and James Hunt (Chris Hemsworth). The sport of automobile racing has historically been a tough sell at cinemas, but Howard scores points by focusing on the contrasting characters of these two great drivers instead of flashing race sequences. The story begins in 1970 and, in short order, traces the developing intense rivalry between Lauda and Hunt. Though they eventually develop a begrudging mutual respect for each other, they were bitter enemies upon first meeting during their Formula Three days. Their relationship is the most fascinating point of interest in Rush, as they’re two sides of the same coin. Both are supremely gifted drivers, and both are exceptionally arrogant. But Lauda is the picture of discipline and self-restraint. He’s willing to risk his life on the track, but will accept no more than a “20 percent” chance of death (not always easy to quantify). Hunt is a fast-living, hard-drinking, weed-smoking party animal. They both feel the same rush while behind the wheel, but off the track their lives couldn’t be more opposite. Between these two, who is living the most fulfilling life? Hunt operates on instinct and adrenaline. Lauda incorporates scientific knowledge in his approach. Only in the very end does it become clear who is ultimately the smarter of the two (and even then, some may argue it’s a largely subjective matter). The race sequences are visceral but sparsely staged. Howard gets in and gets out, allowing us to feel something of the intense sights and sounds without over-emphasizing the competitions. During the climatic race in Japan, with monsoon-like rain drenching the track, one can’t help but feel some of the fear that drives these men as they zoom around at 170 mph, their views obscured by beads of water continuously collecting on their visors. Where Howard and screenwriter Peter Morgan falter is in their depiction of the women in Hunt and Lauda’s lives. As depicted in the film, both men marry rather impulsively; Hunt to model/socialite Suzy Miller (Olivia Wilde) and Lauda to a woman he meets while leaving a party, Marlene Knaus (Alexandra Maria Lara). Neither actress is given much to do, with Lara particularly wasted as the devoted Marlene. It wouldn’t be such a big weakness, were it not for the fact that Howard keeps coming back to these women. That aside, there’s not much to dislike about Rush. Both Brühl and Hemsworth, who initially make for a pair of notably unlikeable protagonists, pull off the minor miracle of making us care about their characters. In the end, Howard incorporates some real footage of both men. The casting is spot-on as it’s possible to not even realize you’re looking at the real James Hunt and Nicki Lauda. Expect Universal to do some serious award-season campaigning for Daniel Brühl. He definitely deserves any recognition he receives.